With almost relentless southerly Gales pummelling large swathes of my local coastline, I have had to head for more sheltered shores to find both clearer, weed-free water (and the bass) in the past two weeks. However, in some ways this has actually done me a favour, as it has presented me with the opportunity to fish some stretches both new to me and ones that I haven’t fished for some time. Nearly the end of a recent exploratory session on a mark that I really thought would produce, but failed to on this day. With a little more breathing space in between my guiding, writing and family commitments lately it has enabled me to ‘put some time in’ during both daylight and darkness into one particular stretch, and one that has got me rather excited. Why? Because it has produced bass every time I have fished it – whether that has been in cloudy, sunny, calm, choppy conditions in daylight, in addition to the only time I have managed to fish it in darkness. 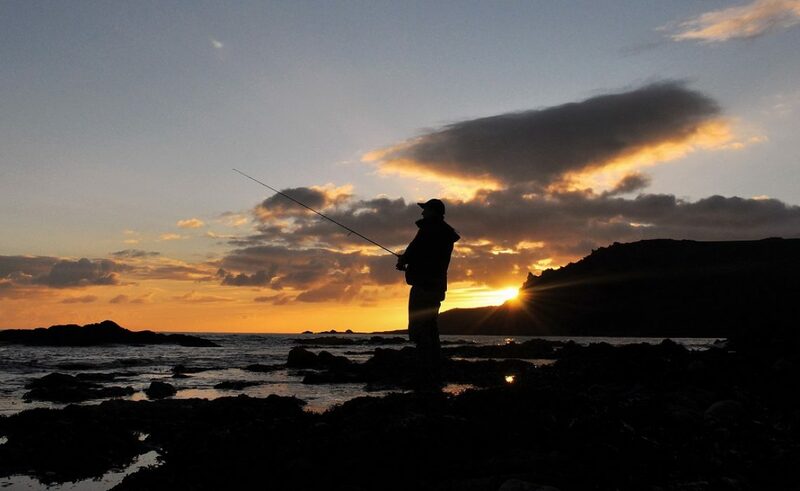 When faced with calm, clear, shallow water and a bright sky my initial thought is to use a lure that looks (shape, size and colour) and acts (movement) as much like the real thing as possible, or to head down the ‘reaction route’. The weedless and weightless soft plastics I have been using lately are the Fish Arow Flash, the new Doomsday Laggin’ Dragon, OSP DoLive Shad or the old favourite, the OSP DoLive Stick. If I haven’t caught, I’ve then moved onto a small surface slider or popper to provoke a more immediate and positive response – a reaction. A cleanly hooked bass that hit the lure just as I started to retrieve it, after I allowed it to sink to the seabed and rest for a few seconds. Incidentally, the reel that I have been using all season (an Abu Garcia Revo MGX 30 above) hasn’t missed a beat – it is brilliant, and I promise I will write a review very soon as I keep getting asked about it! Firstly, the DoLive Stick has done very well for me recently, but only when retrieved in a certain way. After initially letting it descend in a controlled manner and then to rest on the seabed, I have commenced the retrieve very quickly and maintained it, adding the odd twitch of the rod, so that the lure is only 6-12″ under the surface (in water that is around 3ft deep) and so that it is twisting, turning and almost ‘leaping’ around in all directions! Admittedly, I would normally work this particular lure far slower and with one or two twitches, then allowing it to sink or drift in the tide or within any eddies or faster moving water. Or, sometimes I just retrieve them on nothing more than a steady retrieve often alternating between the two methods on each cast. Either way, whatever the bass think it is (a 6″ fish darting around presumably or a ragworm struggling and being overpowered by the tide?) all I know is that they have been absolutely hammering them over the gravely seabed encompassing wrack beds, and within the laterally running current that is present on this mark. On a sunny day when the water is calm and clear a naturally presented soft plastic can be a winning tactic. This one however took the lure when fished very quickly! Note that I haven’t mentioned hard diving minnows… I don’t tend to use them that much nowadays in very bright, clear, calm sea conditions in shallow water, for the reason that far too many fish just ‘follow’ the lure for my liking… Therefore, the choice is relatively simple – go subtle and natural or do the complete opposite, with both having had their moments in the past few sessions. As mentioned, after utilising the ‘SPs’ without catching I have then moved onto the diminutive top-water lures – the type that create a spitting, bubbling, popping and more restrained slashing motion on the surface, rather than a full blown crash, bang, splash, splash affect that is more likely to scare them within the shallows. The three lures that I have been using (and that have been doing the business) are the Patchinko 100, Savage Gear Pop Walker, and the new kid on the block, the Whiplash Factory Spittin Wire. A very underrated lure in my opinion – the Savage Gear Pop Walker has a wonderfully ‘lazy’ and easy to achieve snaking action when fished slowly. Of course, it can also be made to ‘pop’ across the surface as the name suggests. With the small ‘Patch’ I’ve been maintaining a continuous retrieve, whereas with the Pop Walker and Spittin Wire, a pop, pop, slow snaking interspersed with longer pauses (three-four seconds) has accounted for most of the bass. A small bass, but one of three that too a liking for my new lure (the spectacularly named Whiplash Factory Spittin Wire). I believe this is the lure that Henry Gilbey caught his first double figure bass on earlier this year here. Attaching a white DoLive Stick here I commenced the session by using it in exactly the same way as I had with the more natural colours during the day. Cast, retrieve, move a few metres. Cast, retrieve move and so on along a stretch encompassing about 60m, each time ensuring I worked the lure right to my feet, conscious of the fact a bass could swipe the lure in those final few centimetres as they have done many times. After about 45 minutes, it felt to me that the 13.6g lure was being pushed along too quickly in the tide. Therefore, I took a punt and decided to clip on a larger, denser senko that has been hibernating in my lure box all season – the rather aptly named Insane Creations Bass Slayer in the Ghost White pattern. At 6″ and weighing 18g my initial efforts to let the lure trundle along the seabed in the tide proved fruitless. Therefore, I decided to move a further 40m or so in order to work the lure over a series of gravel/shingle banks that I’d discovered over the low tide period the day before. Rather than bump the lure along the bottom, as the tide was less fierce here I recommenced with a fairly rapid straight retrieve (after letting the lure hit the seabed) so that the lure would glide in around 6-12″ under the surface. With the Moon just about to set, I’d made my third cast when about 2/3rds of the way in the rod jolted and the lure just stopped, before a huge splash signalled something rather annoyed at finding a 6/0 hook in its supper! The fish dragged three metres of line from the spool, splashed again on the surface and then turned and headed away from me – taking a further ten metres of line! I actually thought I’d hooked into a real beast in those moments and it was bloody brilliant seeing that rod arched over and thumping away against the stars as a backdrop – I couldn’t get to sleep for ages that night reliving it all! 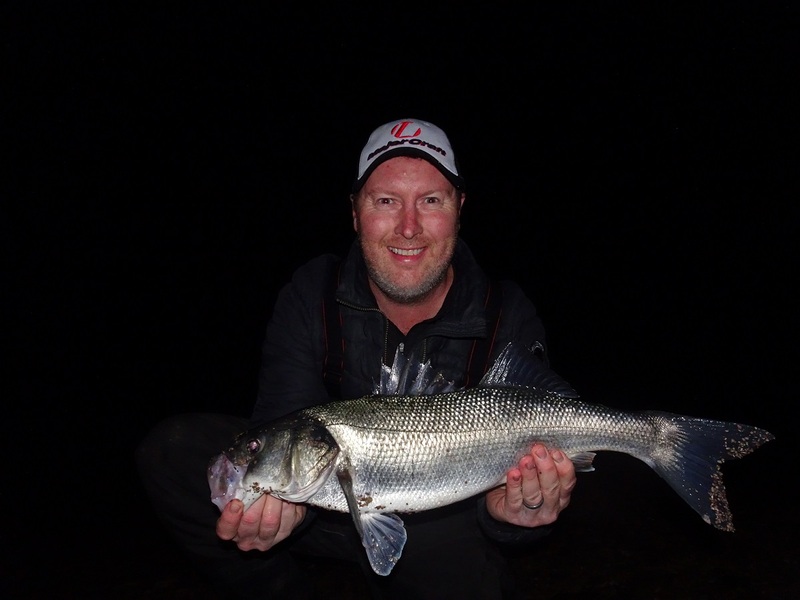 Following that blistering run, the fish then surfaced again, whereby I took the opportunity to quickly slip on my headtorch – but it was at least 90 seconds before I saw the bass properly in the clear water. Once I saw it though I relaxed slightly, as it wasn’t as big as I’d hoped and I could see that it was very well hooked. She it behaved impeccably, apart from a powerful parallel run to my right near the end of the battle, and as I gently guided her into a tiny ‘bay’ between the weed beds I knew it was easily a bass over five pounds, maybe knocking six. A round and thickset bass that measured 62cm, I imagine she weighed in the region of 5½-5¾lb. To be honest, I’m not bothered about finding out what they weigh when they are this size, as it only delays returning these magical fish. Although I have to admit I do carry a sling and a digital scales in my bag just in case a client or I lands ‘the one’ as personally I would want to know. Very interestingly, I didn’t get a touch apart from this bass which suggests to me the small ones just weren’t in residence – not on this tide at least. One thing’s for sure, I will be back here for more as soon as these easterlies bugger off! If you are interested in purchasing my book (that was released on the 8th October) titled ‘The Lure of The Bass’ please see my recent blog post here for details on how to purchase a copy – I currently have limited numbers available as the first 500 have almost sold out! Hope you are keeping well and warm!! Nice bag of fish mate and great to hear you are still catching on surface lures as I’m unconvinced that on the coast I fish we still can, then again I might try Sunday never done it this late so worth a punt. Personally I believe really splashy surface lures have their place but I’ve had success this year on s/l that cause little wake and especially the S/G Surf Walker which I have complete faith in( which I did not) and please give it a thorough testing, you may find it picks out the better fish. Thanks for commenting Laurie – I will indeed be giving the Surf Walker more a test run as autumn leads into winter, as I have a particular mark in mind for it! Hi Marc, really enjoyed your book I purchased recently. Just wondering which variety of flash arrow shad you have had the most success with? Thank you for the kind comments re the book! The pattern that I’ve caught on recently is the J SW 5 Kiemura Dark Purple Silver rigged on a 4/0 weighted Owner Twistlock incorporating the 2.6g weight attached to the hook as standard.